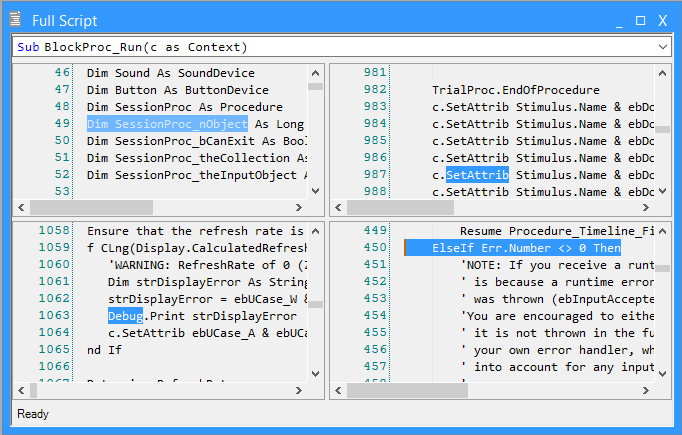 Authoring and editing E-Basic script is enhanced with ScriptSense™, a script-completion and editing tool. ScriptSense™ provides automatic command completion and context-sensitive information about available coding elements. ScriptSense™ also supports an extensive set of short-cut keys to access a variety of useful editing functions, including split views of the editing window, creating and navigating to bookmarks, and commenting/uncommenting one or more lines of script. ScriptSense™ is available when working within E-Studio to create or edit E-Basic script on an InLine object or on the User Script window. It is also available while working within the PackageFileEditor to create or edit PackageFiles. 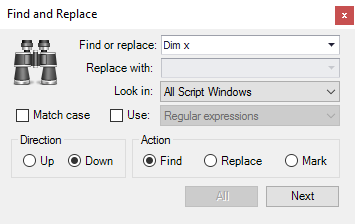 ScriptSense™ features either appear automatically in the editing window when you are in the appropriate context, or are activated by using a variety of short cut keys. The specific ScriptSense™ features are described below. A code completion tool which provides a dropdown choice of property, method, and data types after the user types an object name followed by a period in an InLine object or in user script. 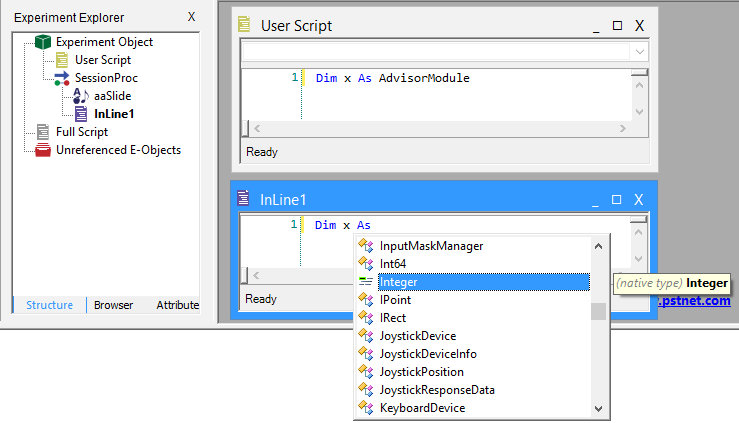 These ScriptSense features are enabled automatically when creating or editing E-Basic script. To split the current editing window in half vertically, move the cursor to the lower left- or right-hand corner of the User Script, Full Script or InLine window until it changes from the outline of an arrow to the left-right splitter control (↔) and drag to the opposite side. To split the current editing window in half horizontally, move the cursor to the lower top or bottom corner of the User Script, Full Script or InLine window until it changes from the outline of an arrow to the up/ down splitter control (↕) and drag up or down. A list of all attributes that have been defined appear automatically after typing. 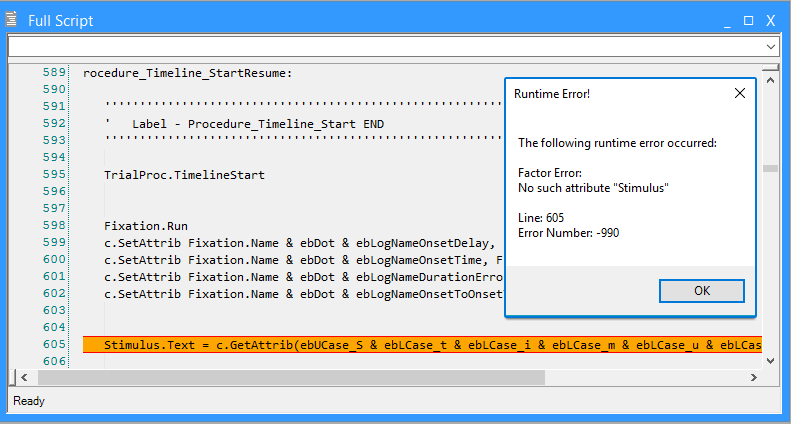 When a compile or runtime error occurs, then E-Studio highlights the line on which the error occurred. If the error occurs in an InLine object, then the InLine object that contains the error is opened and given focus, and the offending line is highlighted. When declaring variables with a Dim x As will show a list of all available data types appear in a dropdown list. Unique icons identify E-Objects, native data types, and keywords. 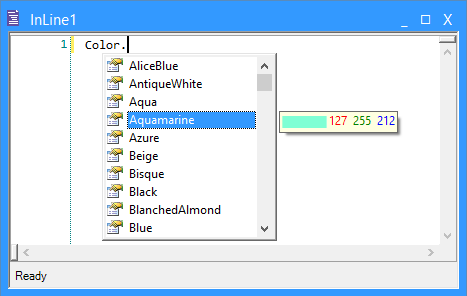 When setting the color value via script, a dropdown list of the color names, a solid block of the color itself, and the RGB values appears. A variety of standard editing functions are activated by entering a simple short-cut key sequence. These functions and their associated short-cut keys are listed below. The Search/Find /Replace functions support the use of wildcards and regular expressions. E-Prime 3.0 provides the ability to search and replace between all script Windows where previous editions permitted the search/replace operation in one script window at one time. The Bookmark functions support the use of wildcards and regular expressions. All appropriate workspaces (User Script, Full Script, and InLine objects) are searched.